In order to maintain the health of your teeth and gums, we recommend a thorough check-up twice a year or every six months. This helps prevent problems from becoming serious by identifying them early and treating them as soon as possible. X-rays are a very important diagnostic tool in dentistry. They enable us to see potential problems that may otherwise go unnoticed. These include impacted teeth, abscesses or infections, cysts, tumors and tooth decay. Our office utilizes a digital x-ray system which allows us to examine your x-rays on a computer screen. 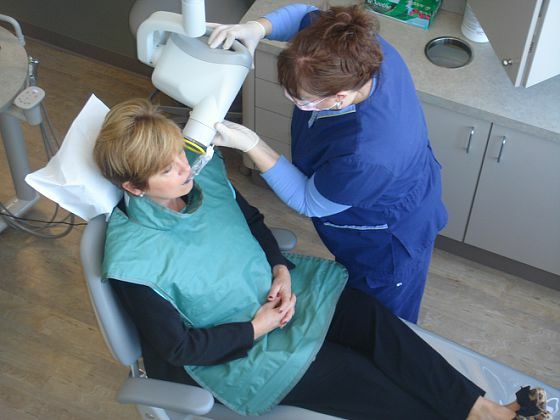 The amount of radiation used when taking dental x-rays is extremely small. You are actually exposed to more radiation while riding an airplane than during a dental x-ray. Regular cleanings twice a year are also very important in maintaining your oral health. Our dental hygienists will use special instruments to remove built up plaque and calculus (tartar) which cause gum disease, cavities, bad breath and other problems. We will also review your homecare so that you can maintain good oral health at home. .
Sealants are a plastic material that is placed on the chewing surfaces of back teeth – molars and premolars. The material bonds in the deep grooves of the back teeth and serves as a barrier against acid producing bacteria. Fluoride is a naturally occurring mineral that research has shown can prevent tooth decay and can even reverse the early signs of tooth decay.